There are a few spaces left, so hurry and register now for the joint SCAA-PALMCOP Spring Workshop! In "Bind and Loose: Book Repair and Restoration" Fr. 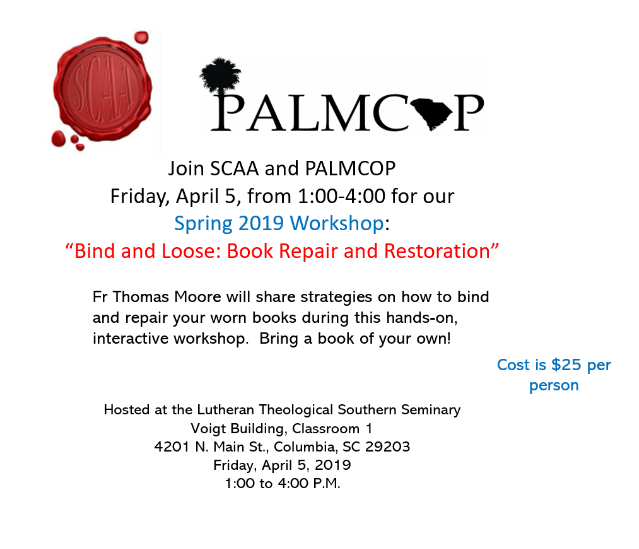 Thomas Moore will share strategies on how to bind and repair your worn books in this hands-on, interactive workshop. All participants are required to bring a book of their own to repair. The cost of the workshop is $25 per person. The workshop is being held at the Lutheran Theological Southern Seminary in Columbia, SC on April 5, 2019 from 1:00 to 4:00PM. Hope to see you there! The Times-Democrat recently published an article highlighting the Salley Archives of the Orangeburg County Historical Society as part of its "55 Things to Do" series. The article can be found at https://thetandd.com/news/local/county-s-history-preserved-orangeburg-artifacts-documents-displayed-at-salley/article_522c504c-ede2-5138-910a-5be7ed285c69.html. MAC is soliciting applications for the 2019 Archie Motley Memorial Scholarship for Students of Color (http://www.midwestarchives.org/motley). The scholarship is designed to provide financial assistance to students of color pursuing graduate education in archival administration and to encourage ethnic diversification of the MAC membership and of the archival profession as a whole. Two $750 scholarships, accompanied by one-year memberships to MAC, will be awarded. In order to be eligible for a scholarship, the applicant must be of African, American Indian, Asian or Pacific Islander, or Latinx decent; must be a student currently enrolled in or accepted in a graduate, multicourse program in archival administration; and must have a grade point average of at least 3.0 (on a 4.0 scale) in his or her academic program. If the program is not listed in the SAA Directory of Archival Education, http://www2.archivists.org/dae, the applicant must provide proof of the multicourse standard by submitting copies of course descriptions from the institution’s current departmental catalog. Applicants are not required to be residents of or attend school in the MAC region. · Two letters of recommendation. Applications must be emailed or postmarked by March 1, 2019. Awards will be announced no later than June 1, 2019. PALMCOP Annual Conference Coming Soon! PALMCOP will be holding its Annual Conference "Preserving Bit and Bytes" on February 8, 2019 at the Lutheran Theological Seminary of Lenoir-Rhyne University in Columbia, SC. The conference will focus on the challenges of digital archiving; the latest technology and trends in digitization; and exciting projects from around South Carolina. More information--including a link to the online registration form and descriptions of conference sessions--can be found at http://www.preservationsc.org/annual-conference.html.